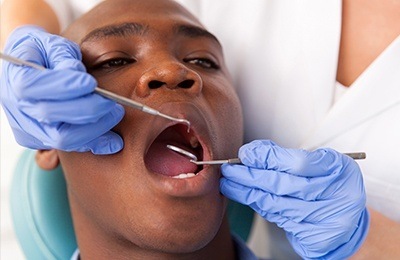 At every hygiene visit, we examine all the tissues of your mouth, including gums, cheeks, lips, tongue, and jaw. Many patients are surprised at the large amount of surface area that we examine during an oral exam. It is just as important to have regular soft tissue screenings as it is to have a professional dental cleaning. Oral cancer can afflict anyone, although tobacco users put themselves at significantly higher risk than non-users. Chewing tobacco has up to 3000 different chemicals, including the same compounds used in pesticides and embalming fluid. Cellular changes below the surface aren't always detectable until they've advanced to a critical stage. Many other non-cancerous changes can occur in your mouth's tissue, from oral warts to autoimmune lesions. Dr. Lankupalli and Dr. Patel draw on their backgrounds in oral pathology to evaluate any abnormalities and determine if they should be monitored or removed. We understand tobacco holds strong addictive powers over even the most health-conscious people. If you're determined to quit, we want to support you in your efforts. Talk to your hygienist or Dr. Lankupalli and Dr. Patel about the strategies and resources we have available so you can kick the habit.